The Basics: Uwe Rosenberg, famed designer of the world-shatteringly popular Agricola and equally notable Le Havre and Caverna, once made a funny little card game about bean farming. The great thing about Bohnanza is that it’s funny without trying too hard. 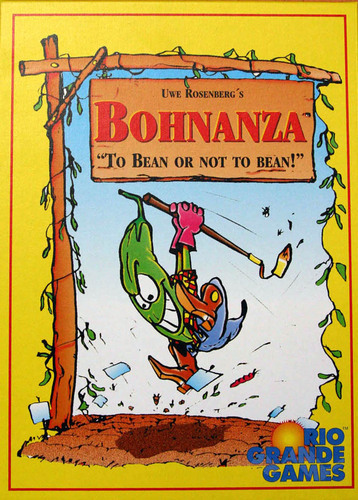 Whereas other games might rely on quotes and lame jokes from a TV show to get a laugh, Boh trades on its endearing art, its puns, and the mad scramble of comic, hard-nosed bean trading that makes up the play of the game. Basically, players take it in turns to plant bean cards from their hand into one of two bean fields in front of them hoping to eventually harvest the beans for cash money. Each field can only have one kind of bean out of the ten or so that are present in the game’s deck, though, and the game requires you to plant your cards in order. This means that unless you get rid of your unwanted cards or play carefully you won’t be making much off your bean fields. The difficult decision points and habit of forcing player errors are design elements that follow Rosenberg’s portfolio from 1997, when this game was published, to his later games. What we did wrong: Two things; first, I overlooked a rule forbidding players from harvesting a bean field with only one bean card in it. This is important because players will often try to protect a valuable bean field by sacrificing a worthless bean field next to it. Players may also try to offshore bean cards of a certain type because while they are in your bean field they are out of play and unavailable to other players who might need them. Second, when trading beans, the player whose turn it is does not need to plant them immediately, but holds them to the side until his turn is over and then plants them. Everyone else needs to plant the beans they trade for immediately. This is less important of a rule but allows the player a little more freedom in starting a new bean patch and cashing out of an existing one, which allows for more high-value plays. Conclusion: This game is deservedly a classic. The frantic trading of beans to protect your investment, the funny card art, and the low price point make it very attractive. Also, despite getting a couple of rules wrong, the game is easy to understand and fun to teach. In fact the last time I played we had a couple of foreign exchange students playing who didn’t understand english very well and were still able to play the game just fine.